Take your evaluation tool to the next level! Districts work diligently on programs that increase high student academic results. Too often, however, results are not as intended. Effective school improvement planning and evaluation can make the difference between intentional and unintentional results. 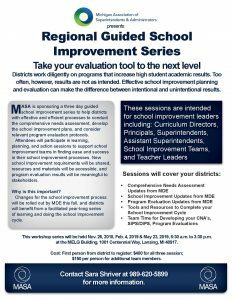 MASA is sponsoring a three-day guided school improvement series to help districts with effective and efficient processes to conduct the comprehensive needs assessment, develop the school improvement plans, and consider relevant program evaluation protocols. Attendees will participate in learning, planning, and action sessions to support school improvement teams in finding ease and success in their school improvement processes. New school improvement requirements will be shared, resources and materials will be accessible, and program evaluation results will be meaningful to stakeholders. Changes for the school improvement process are being rolled out by MDE, and districts will benefit from a facilitated year-long series of learning and doing the school improvement cycle. This is the final session in a three-part series. For information on how to attend this training, please contact Sara Shriver at (989) 620-5899 or sshriver@gomasa.org.